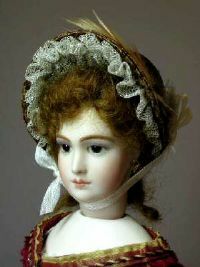 or any 12" French Fashion doll. 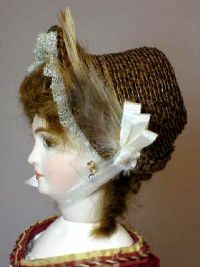 The brim of this Lady Doll straw hat is turned up on the left side and may be finished on the inside with ruched net or lightweight silk. A ribbon, twisted in several places, may be added around the crown, and a looped bow and feather can be used to trim the front of the crown. It fits the 12" Ultimate Fashion© dolls. This hat was featured at the French Fashion Doll Workshop held April 11-14, 2013 at The Fabric Depot 700 SE 122nd Ave. Portland, Oregon. 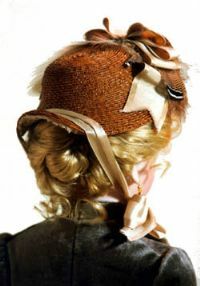 This hat requires approximately 7 yds of 1/4" braid sold separately or as part of a kit. Antique Replica. Designed by Nelly Valentino. 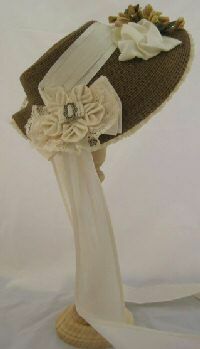 This wonderful hat design was inspired by the hat pictured on the front cover of The Ribbon is Free book on antique hats. It has been sized to fit the 12" Ultimate Fashion© dolls. 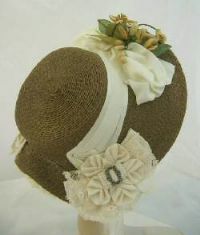 This hat requires 8 yards of 1/4 inch hat braid sold separately or as part of a kit. 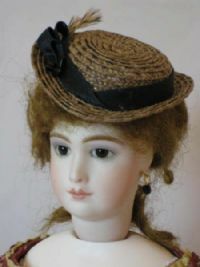 This darling hat fits 12" French Fashion Dolls. 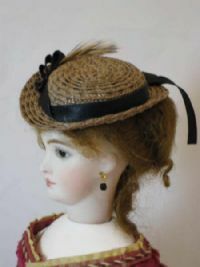 The Hat design is the same as 039 now resized to fit the Ultimate Fashion© dolls. 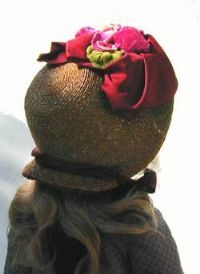 If needed for the larger French Fashion heads, please let us know as there is also another size available for those. 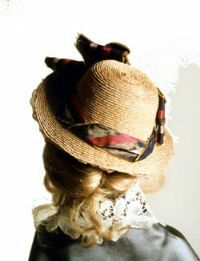 Requires approximately 8 yds of 1/4 inch hat braid sold separately or as part of a kit.